This makes a perfect lunch with some crusty bread. Preheat the oven to Gas Mark 4, 180°C (350°F). Slice the aubergines lengthwise and mix with 6 of the garlic cloves and 1-2 tablespoons of the oil. Spread out on a baking sheet. Season well. Roast until tender – this will take approximately 20 minutes. Grill the peppers until well blackened. Cover with a tea towel and leave to cool. Then remove the skins and cut into strips. Whisk the vinegar with the remaining oil in a large bowl, peel and chop the remaining garlic and add to the bowl. Mix in the aubergines and peppers, scallions and olives. Taste for seasoning. 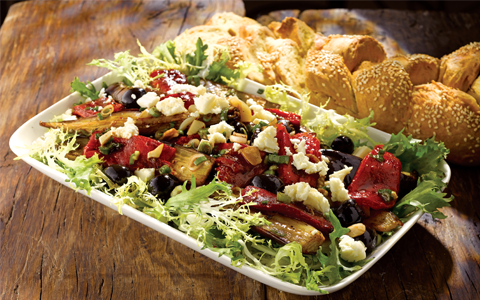 Tear up the salad leaves, arrange on a large platter, top with aubergine mixture and sprinkle with cheese. 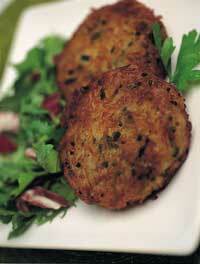 A fresh and crispy potato change with your main meal! Peel and grate the potatoes into a bowl. (If you have a food processor use the grater attachment to prepare the potatoes. It’s quicker and saves on grating your knuckles!). Add the chives and mix well. Heat the butter and olive oil in a large non-stick frying pan. Quickly shape round patties from the potato mixture (about 2 inches in diameter and ½ inch thick) and put onto the hot pan. Using a spatula, press down the cakes to keep them flat and even. Fry for 4–5 minutes until crisp and golden. Then turn over and cook on the other side until golden. Remove and drain on kitchen paper. Keep warm in the oven until ready to serve. Melt the butter in a large heavy saucepan. Add the onion and garlic and stir for 4 minutes over a medium heat without adding colour. Stir in the tomato puree & the tomato quarters. Add the sugar & stock, cover with a lid, increase the heat and bring to the boil, then reduce the heat and simmer gently for 15 minutes. Remove from the heat and puree the soup with a stick blender or alternatively in a food processor until it is completely smooth. Pass the soup through a sieve. 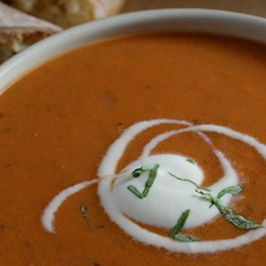 Return the pureed soup to the saucepan, stir in the Avonmore cooking cream and reheat. Season the soup to taste with sea salt and freshly ground black pepper. Ladle into warm serving bowls and sprinkle with the freshly chopped basil. Place the flour, baking powder and sugar in the food processor. Whiz to mix well. Add the eggs, yoghurt and enough milk to make a thick, but not too thick batter. Heat a knob of butter on a non-stick pan. Take spoonfuls of the batter and cook on the hot pan for 3-4 minutes on each side until nicely browned. Keep warm. 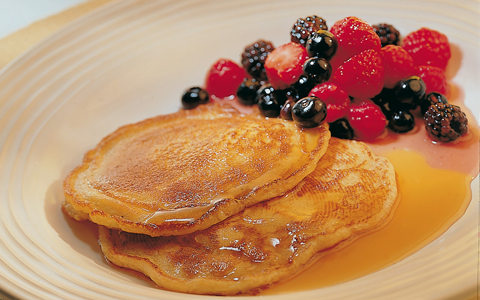 Serve with berries sprinkled with caster sugar and maple syrup. A spoonful of Greek style yoghurt would also be very good served with them. 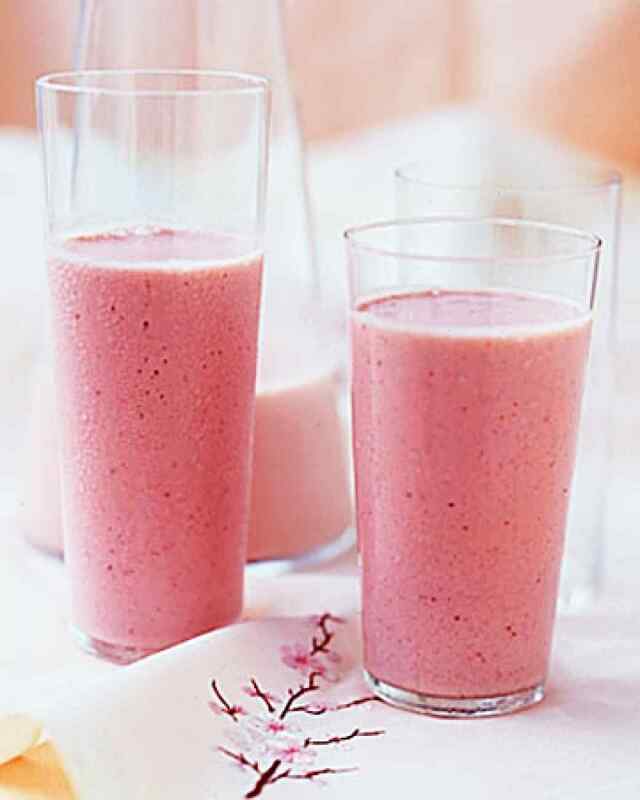 Put all the ingredients into a blender and blend for about 1 minute until smooth. Add more milk to adjust consistency. Pour into two tall glasses and serve. Preheat the oven to Gas Mark 8, 230ºC (450ºF). Sift the plain flour, salt and bicarbonate of soda into a large mixing bowl and stir in the wholemeal flour, 25g of the oats and 75g of the grated cheese. Make a well in the centre, add 450ml of the buttermilk and mix together to make a soft but not too sticky dough. Add a little more buttermilk or milk if the mixture seems a little dry. Bake the loaf on the middle shelf of the oven for 15 minutes. Then lower the oven temperature to Gas Mark 6, 200ºC (400ºF).and bake for a further 20-25 minutes, until it sounds hollow when you tap the base. Leave to cool before serving. 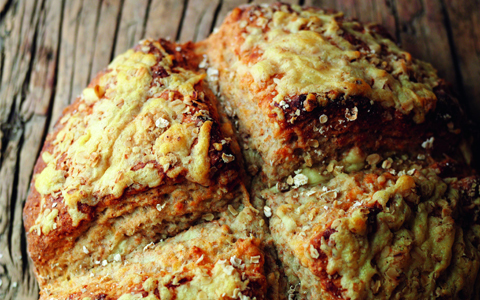 This is a delicious, easy and very healthy bread. Mix the flour, bread soda and salt together in a bowl. Combine the egg with the buttermilk and honey then mix into the flour. Add a little more buttermilk if the mixture is dry – it should be a soft dough. Then pour the lot into a lightly oiled loaf tin. 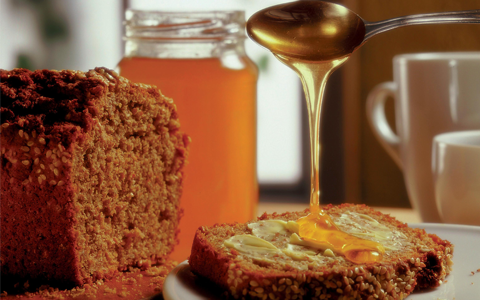 Sprinkle the sesame seeds or porridge oats over the top of the loaf if using. Bake for 45-50 minutes. To know when it is cooked simply tap the bottom of the loaf – it will sound hollow when it is fully cooked. Remove from the tin and wrap in a clean tea towel while cooling. This will keep the crust soft.